With Holocaust survivor Ruth Ravina, center, are Sue Rosenthal, left, past chair of the Holocaust Council of Greater MetroWest, and Susan Neigher, copresident of NCJW, West Morris Section. 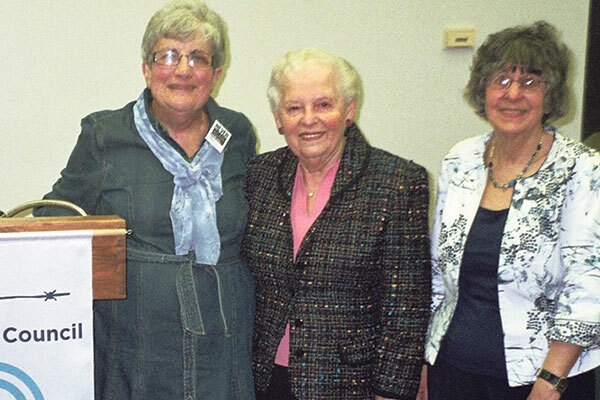 Holocaust survivor Ruth Ravina of Montclair told her childhood story of horror and rescue at an April 26 event organized by National Council of Jewish Women, West Morris Section, and the Holocaust Council of Greater MetroWest. Ravina was born in Kozienice, Poland, in 1937. After her parents were taken by the Nazis to a slave labor camp, she remained with her grandparents and cousins. When the ghetto was about to be liquidated, three Jewish girls escaped, taking Ravina with them and bringing her to the home of a Polish-Christian family, where she was given refuge for some time. After six months, she was smuggled to her mother inside the slave labor camp. Her mother managed to keep her small daughter hidden in two camps. Her father died in Buchenwald. Ravina was the only Jewish child from her town to survive the war. Ravina will also be the featured speaker at Newark’s 29th annual Holocaust Remembrance Observance on Friday, May 27, at 10 a.m. at the Newark Museum. The event — the state’s largest and oldest observance of the Shoa — is sponsored by Newark Mayor Ras J. Baraka, The Berger Organization, and The Newark Holocaust Remembrance Committee, which is now in its third decade. The remembrance focuses not only on memorializing the victims of the Holocaust, but on the importance of remembering the past for the sake of the future. The observance will feature a musical performance by the Apprentice Chorus of the Newark Boys Chorus School and the involvement of Newark public school and Catholic school students who are studying the Holocaust as part of their curriculum.